Our Credit Unions – Campaign for Regional Community Public Banks in Ireland — Banking in the Public Interest! The PBA, founded by the Public Banking Forum of Ireland in 2016. * Further restrictions are being put on the Credit Unions by Government and the Central Bank continuously to prevent them competing. * The CUs cannot survive under their current model. * Their funds of probably €7bn are by law held in the private banking system, returning just 0.9% return. * Lending is down over 50%. * They are the only form of Social Credit System we have, but are not Banks. They have just a few percent of the market. They are excluded from the Payments System and restricted to prevent them from being any real competition to the Commercial Banks. * They currently are starting to fight back and not before time (They were warned by PBFI members of their plight in 2013). Let’s hope it is successful. The CUs could setup regional banks, take back their funds from the commercial banks (If there still there) and lend them for productive purposes in the communities. Credit Unions: An Endangered Species in Ireland’s Blighted Banking Landscape? This development holds great potential for the Credit Unions but it could also pose a great threat to them; we await more detailed information on the proposal. The potential exists for the Credit Unions to at least quadruple their business. We also need to introduce a Regional Public Banking System to support the Regions and SME’s. 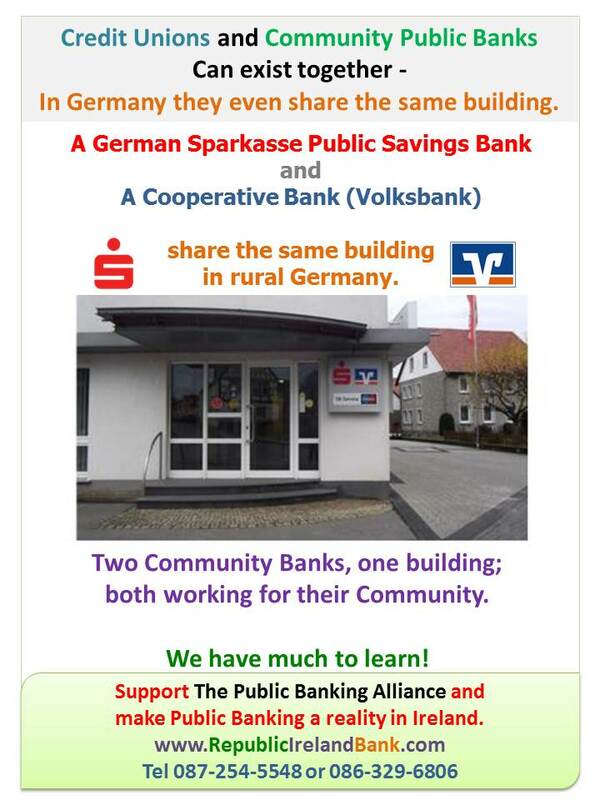 We have a long way to go to match the almost 70% Community Banking System that exists in Germany (Co-op & Public Banks); the system that serves their economy so well.